About 5-7 years ago, I made a bag for one of my really good friends, Kristie. At the time, she was cosplaying Kobato. She was fairly new to cosplaying and was struggling to complete her cosplay. Her birthday is the day before mine and we were going to spend the weekend of together. I decided that for her birthday gift I would make her Kobato’s bag. A few years later, the bag was wearing thin so Kristie – now in grad school – wanted a new bag. She actually had a bag in mind, modeled off a character in some anime; to be honest, I can’t remember because at the same time I had waned out of the anime fandom. But it was a basic black cross body bag with interior pockets. I remember using a pretty Japanese-esque cotton print for the inside. Fast forward to present day. Kristie is now living and working in Japan. She contacts me via text to ask for a 3rd bag since the 2nd is on its last legs. Only this time she was even more specific. She wanted a backpack like Marinette’s from Miraculous Ladybug. She needed a backpack since it was more convenient to wear one while biking to work. I’ve made a number of bags in my life but never a backpack. It was going to be a challenge. Kristie did tell me that if it was impossible so just make the bag a cross body. But no, the perfectionist costumer in me was DETERMINED. So I set out to make a backpack. It was not an easy task, and I spent many moments huffing and snarling at my machine for not wanting to cooperate. I also did what I promised I would never do after Elsa: hand embroidery. Last time I stubbornly hand embroider satin, this time duck canvas. Knowing that this bag was primarily going to be used to carry the textbooks Kristie uses in her classes, I needed to find a fabric stronger than the bottom weight twill I used in previous bags. Duck canvas seemed to be a good fabric to use. It’s sturdy and almost waterproof on its own. The only downside is it was thick and would require heavyweight thread and needles. To make the bag unique, I added some hand embroidered details on the front with Kristie’s initials and a free form flower and swirl design. I couldn’t replicate Mari’s design on her bag without the use of applique or an embroidery machine so I did my best approximation. For the record, embroidering duck canvas is 50 times worse. My fingers were aching after only an hour of simple stitching. But it’s pretty, and I’ll do just about anything for family and good friends. To reinforce the canvas and give the bag its distinct shape, I used heavyweight Pellon interfacing. The interior lining was a pretty pink cotton with gold roses. When making such bags, I pretty much free form everything. The bag is roughly 14 inches wide, 10 inches tall, and 4 inches thick. It has a front flap with hand embroidered initials and details, held closed by parachute clips and sports a handle to carry like a briefcase. The 2 inch wide shoulder straps are made from duck canvas, batting, and nylon cord with plastic sliders. The bag itself has one large exterior pocket on the front, one large interior pocket, and two smaller interior pocket. There is also a clip for keys. I’m quite pleased with the result but just hope it stands up to abuse. Japanese textbooks are much smaller than American textbooks but still. The only two requests I was not able to fulfill was a phone pocket (not enough fabric, I estimated just enough) and a zipper (2 layers duck canvas + 2 layers Pellon + 1 layer cotton = my machine was not happy). The one thing I am most displeased about is my stitching where it’s visible. I try my hardest to make visible stitching as straight and as even as possible in everything. But the thickness of this just wouldn’t allow it. I adjusted my stitch length and tension so many times but nothing seemed to work. In the end, I gave up and decided function and strength outweighed pretty, straight stitches. Currently, the bag is on its way to Japan, stuffed with post-Easter goodies. I’m really hoping Kristie likes it in person as much as she liked the photos (which, by the way, were taken hastily on my phone so I apologize for the pictures and the messy state of my sewing room). As soon as I finished my Rey wig, I started searching for fabric. I happened upon a forum where someone had posted the fabrics used in the movie (though I can’t find the link anymore). Using that information, I tried to find fabrics in creams, ivories, and pale olives in the same fibers – or as close as I could get. I knew that I may have to do a little weathering and/or dying to get the right look but I wanted to start with as much off white as possible. First: capris. I purchased a pair of yoga capris in a light gray rayon/spandex fiber. It’s the wrong fiber type (Rey actually wears silk capris) but the drape in the right flow. (I originally made capris from silk dupioni but they didn’t drape right.) The gray was a little to bright for the rest of the outfit so it took a bath in some tea and is now a more dingy gray – which is perfect. They are super comfortable to; I may end up living the entire summer in those pants. Second: shirt. I made the shirt out of jersey knit in a sort of ivory color. I used Burda 7742 for the base. The collar piece I did modifying the sleeve placket for an Archer shirt, then took an extra strip of fabric to finish off the color. For the sleeve caps, I took excess fabric, pinned it on, cut until I liked the shape, then stitched. I left the sleeve caps unfinished since it appears as if Rey simply cut off her sleeves in the film. The shirt is a bit see-through, but I plan to wear a tannish tank top underneath. Plus the sash will cover up the important parts. Sash: originally the sash was going to be made of ivory rayon challis, but I soon realized that – like the pants – while it was the proper fiber the drape and feel was all wrong. Instead I used ivory cotton gauze (originally for the arm wraps). I cut the gauze to 1/4 its width, french seamed 3 of the pieces together, then made a narrow double rolled hem on either side. I made a single rolled hem on the short edges to keep from fraying during the dying process (these stitches may come out later). The french seams are strategically placed so that one is on the right shoulder seam of the shirt and the other is on the back near the waist (to be hidden by the belt). Arm wraps: I originally intended to make the arm wraps out of jersey knit and gauze so that I could just pull them on. That didn’t quite work since 1) gauze isn’t very stretchy and 2) I used the gauze for the sash. Instead, I headed to my local drugstore and bought elastic bandage. It had the right look and stretchability. I thought it would take way too long to constantly wrap my arms, but after a test run that took less than 2 minutes it wasn’t so bad. There’s a little bit of restriction in my elbows but nothing horrible. It’s kind of like wearing compression sleeves and, I’m sure, after a bit of movement it will be fine. Now for the hard part: dying and staining. To get the sweated in look, everything was placed in a dye bath of tea and/or coffee. I used tea bags to sponge on stain near the shirt collar and underarms. Then did an all over dying for the shirt and sash in coffee to get a more yellowed color. More dying in tea for a deep set in stain. Then finished with pearl grey RIT dye for a worn look; the sash went into the RIT dye the longest for a deeper, dingy-er looking stain while the shirt went in for just a minute or two for a dirty look. The above image is the before picture; you can see how everything is just very white and pale. And here’s the after photo. I am quite happy with the way everything turned out. Dying fabrics is one of my least favorite activities crafting wise so I’m quite pleased with how everything came out. Next, the accessories – or at least the most essential ones. I have been a Star Wars fan since I was a kid. I was born the year after Empire Strikes Back was released, but I didn’t actually watch any of the original movies until I was a pre-teen. There was a point in my life during which I could recite verbatim every line in the original three movies. Like everyone one, I am not a fan of the Phantom Menace but I do like Attack of the Clones and Revenge of the Sith – but only due to Ewan McGregor portraying my favorite character, Obi-Wan Kenobi. Now that The Force Awakens has been released, I am falling in the love with the series all over again. I have been told by a few of my friends that they can picture me cosplaying Rey. I haven’t actually seen the movie myself (stupid motion sickness), but I’ve read spoilers and do – from what little I know – enjoy her character. 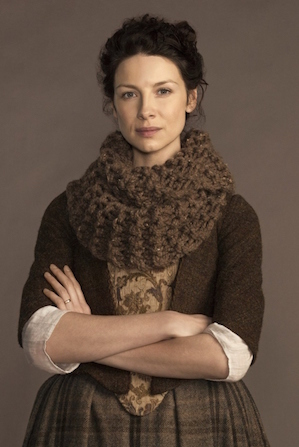 2016 is the year I take a break from cosplaying to focus on other activities, but Claire Fraser was already on my to-do list. I needed a simpler cosplay for those few cons I am attending. Rey seemed like the best bet: simple to construct (save for the staff), simple to wear. First part: wig. I used my Peggy Carter wig from WigIsFashion for Rey’s wig. I love Peggy but will likely not wear her in a cosplay in a long while, so to save funds I styled her wig for Rey. It turned out to be not only the perfect shade of brown but the perfect length for all the buns. It was a relatively simple process. First, I combed back the wig, gathered a small piece at the front and top, and tied it off with a small black elastic band. This would be the little gathered piece at the front of Rey’s head. Then, the rest of the wig was divided into three equal sections to serve as the three buns. Using black elastic bands, these sections were tied off, then partially pulled through to make the loop. A small section of loose hair from just under the loops was wrapped around the black elastic bands then secured with bobby pins. Two small curly sections were left free just in front of the ear parts to simulate the wispy strands of Rey’s hair. And that’s it! I find a curly wig better for styling than straight wigs. If anyone is looking to replicate this style, I recommend a curly lace front wig no longer than 20 inches in length (any longer and you’re have too much extra fiber to contend with). Currently my fabrics are on their way so I will hopefully soon get to making the actual outfit. When I set out to cosplay Peggy Carter, I didn’t ever think I would make her red dress from Captain America. I had no occasion or place to wear such a dress to. But it’s Peggy and I love her, and I love her in red. Plus I figured just in case I do have an occasion I should have a dress ready. 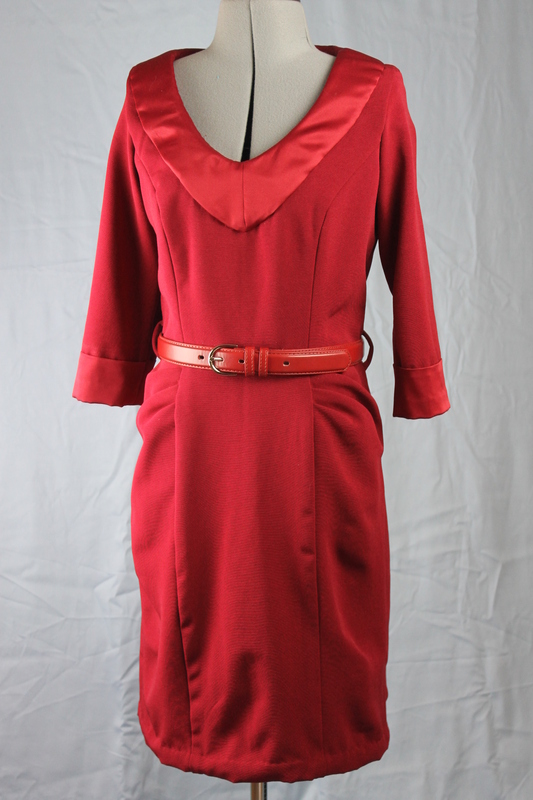 The dress is made of red polyester suiting with (of course) red stain for trim. The pattern is a modified Simplicity 2648 (this pattern is discontinued and I had to get it through Amazon). The only changes that needed to be made were the sleeves and the pleats on the hips. I followed the pattern pieces of an A cup and curvy. I added the sleeves from Simplicity 1687 and added satin trim to them. For the collar trim, I used leftover blue polyester lining to draft a pattern but cut out the pieces from satin. I wished I had made them a little more narrow but didn’t realize how wide they were until I started photographing the dress. I like how the skirt and hip pleats came out. I have leftover red fabric and am contemplating making a skirt of it for work. This dress took a little longer than I expected. I originally intended to add lining to the dress to give it a better finish and a smoother drape. But the added lining made it difficult for me to properly use my arms when fully zipped up. Also, I had first used a different sleeve pattern that I realized was better suited for slightly stretchier fabrics resulting in even more limited motion in my arms. I spent an entire morning ripping out the lining and top to make a new top with new sleeves that fit a lot better. The shoes were acquired off eBay; they are a smidge brighter red but nothing too obvious. The belt was acquired off Amazon. 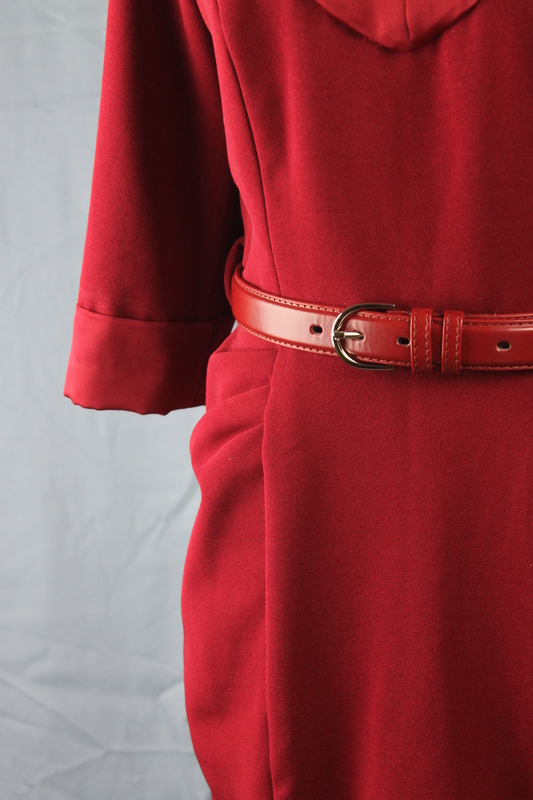 I actually bought three skinny belts for this dress: one bright red, one metallic red, and one light burgundy. The bright red came first and did not match any of my fabrics or shoes. The metallic red is a beautiful belt but a touch too vibrant. The light burgundy ended up being the perfect choice; I figured it would but don’t mind having additional belts in my wardrobe. I got a lot of help from adriuh via Instagram on this dress. She had already made her own version and was gracious enough to help me when I had questions. She showed me the pattern she used as a base, the draft on Pinterest of how she did the pleats, and even shared her setting pattern for Peggy’s curls and waves. Honestly, without her help I’m not even sure if making this dress would have ever occurred. 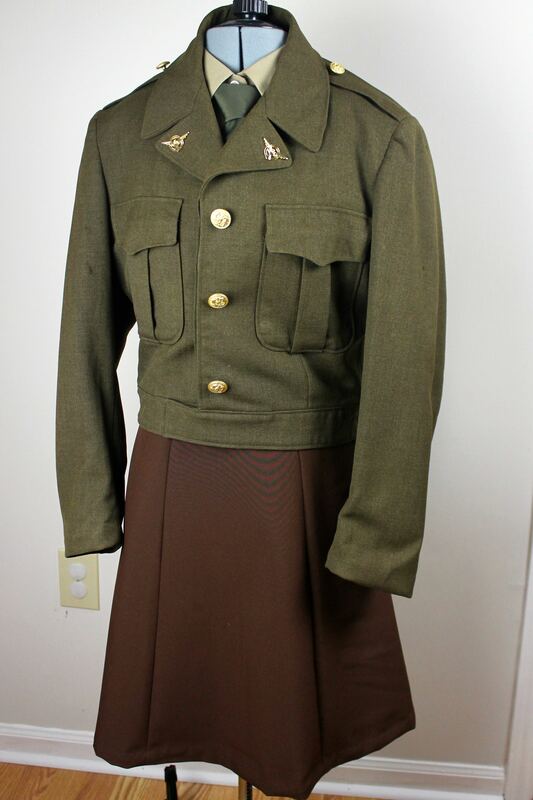 So my second Peggy Carter cosplay is done! I think next I’ll work on my blue and red dress from the tv series since it’s my favorite. Agent Margaret “Peggy” Carter is one of my favorite female characters. I loved her from the start in Captain America: The First Avenger; loved her even more in Marvel’s Agent Carter. Peggy is really what got me going into the vintage fashion. She’s my inspiration not just in fashion but also in life as she is a strong, confident woman. I love her blue suit in Agent Carter and have plans to cosplay the outfit at HeroesCon this year. But before that I wanted to cosplay some of her Captain America uniforms. I decided to start with her Project Rebirth outfit. I made a few changes to the outfit since I had plans to used some of the pieces (mostly the skirt) as a work skirt as well. I chose colors that could still pass for being a uniform to keep with the style. I used Simplicity 3688 for the skirt. 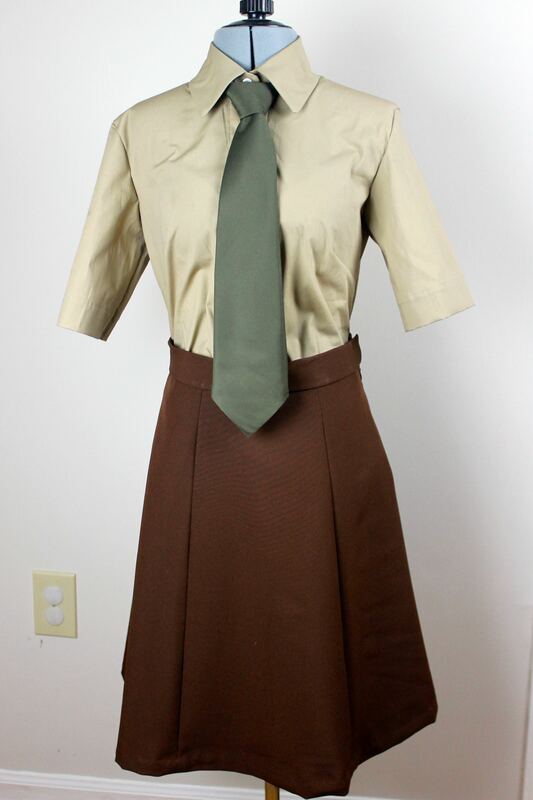 The skirt is made of brown polyester suiting and brown polyester lining; it’s a slightly brighter brown than the uniform skirt but not bad for work. The pattern has extra seams in the front and back which I opted to keep. The shirt is a short sleeved button down I made using an old pattern in a tan/beige stretch poplin. Unfortunately the pattern was designed to not button all the way to the collar so it’s a little tight up there. I have an alternate white long sleeved button down shirt I bought a while ago to use every now and then. Peggy’s shirt appears to be white but I made a beige alternative. I also made it short sleeved so I could wear this cosplay in a Southern summer without killing myself in the heat and humidity. I don’t remember the pattern number, sorry to say. I have a lot of button down shirt style patterns and do not recall the exact one I used. 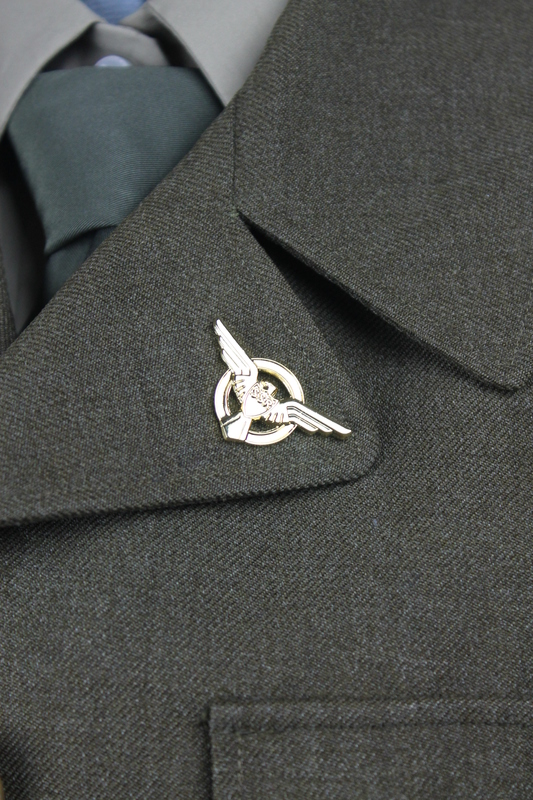 The tie was made using olive green suiting and black polyester lining. I used Sweet Shop Sewing’s free tie pattern. It was really simple to make but somewhat long. I have to tuck it into the skirt so it doesn’t show. The only thing I omitted was the little tab to hold the back of the tie, but it’s not necessary for my needs. …or so I thought. Since the Eisenhower was a vintage and used piece, it had some damage. The seller did mention damage in their listing but was not specific in details. Most of the damage was confined to the sleeves with tiny holes in the shoulder and upper arm areas. Also the sleeve edges were worn and had holes. The most significant hole was on the left sleeve around the elbow area. I didn’t worry myself over the tiny holes since they weren’t too noticeable. The sleeve edges I managed to fix by shortening the sleeves to a more appropriate length for my shorter arms. The hole on the elbow was more problematic; I managed to sew it closed but it’s still very visible. Since I don’t plan on entering any craftsmanship competitions with this, I can deal. The shoes are from B.A.I.T. Footwear (not shown), the company that makes Peggy’s shoes from Agent Carter. The style is Roberta in tan. I had to go up in size since I have wide feet so they are a little long but oh so cute and fairly comfortable. They are not the exact shoes, as I need shoes with straps (I don’t walk well in heels without straps to hold them on). But they are brown and vintage inspired, which is appropriate for Peggy. The S.S.R. pins and airsoft gun (also not shown) are from sellers on eBay. They are the perfect props, and the airsoft gun looks just like a Walther PPK – the type of gun Peggy (and James Bond) use. 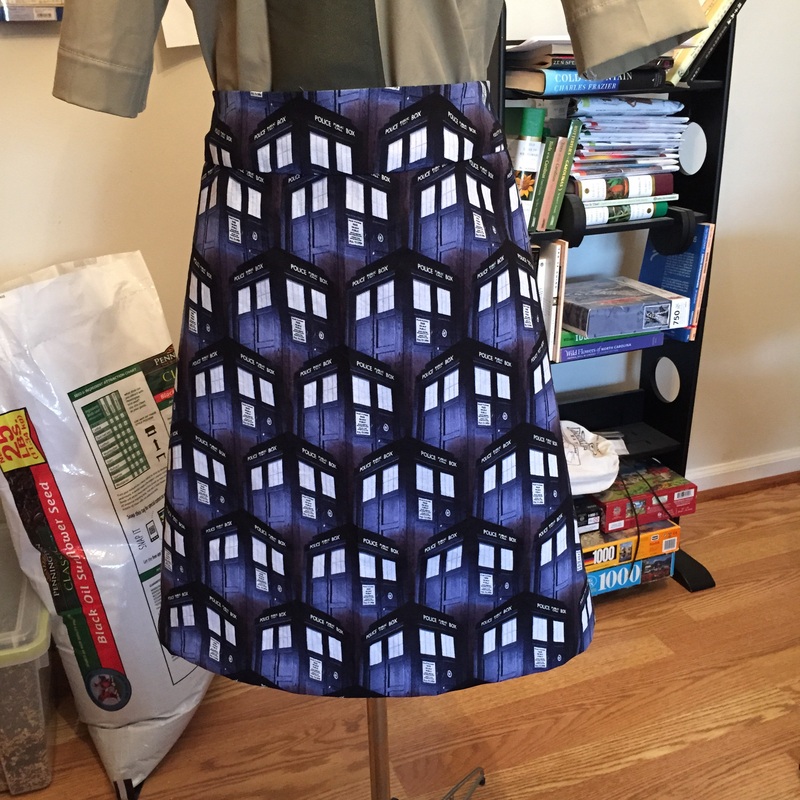 What happens when a Doctor Who fan finds out that her local Joann Fabric and Crafts have Doctor Who fabrics? She goes and buys some of course! Not only did I buy fabric, so did a bunch of my friends in the hopes of making clothing items. T.A.R.D.I.S. and Daleks and flannels, oh my! I bought two yards of the repeating T.A.R.D.I.S. print and 4 yards of the exploding/Van Gogh T.A.R.D.I.S. print. As much of a not fan of the Daleks as I am, I am almost tempted to go back and get that fabric to make a skirt out of. I turned the repeating T.A.R.D.I.S. print into an A-line skirt. I made it in half a day, a week before attending Triad Anime Con where I wore it on Sunday. It’s a comfortable skirt since both the fabric and the lining are cotton based. It’s not something I can wear to work because the print is…well…see for yourself. It’s a bold print, one which I can only wear on my days off from work or to cons – and also only with solid colored tops. But I really liked the cut of the skirt so I will probably make another in a more work appropriate print. (By the way, the pattern is Simplicity 1717, style B curvy.) Because I am apparently curvier than Simplicity thinks curvy women are, I had to add two extra darts in the back to fit the waist properly. One of my friends, Angela, bought the exploding/Van Gogh T.A.R.D.I.S. fabric and made a fabulous dress out of it. This, naturally, made me want to make a dress of my own once I had acquired the same fabric. It took a while to decide – with the input of friends – which pattern to use. I ended up deciding on Simplicity 1755, dress A but with the skirt length of dress B. I used the T.A.R.D.I.S. fabric for the main dress, a navy stretch sateen cotton for the collar and removable belt, and a navy polyester lining in the bodice. Except for the DW fabric, everything else used to make this dress came from my hoard (yay for using up scraps!). As with the skirt, I had to make a few adjustments, mostly to the top. I had to shorten the top at the neck edges by a total of about 2 inches. Then I took in the sides about 1 inch under each arm; I cheated and made “pleats” under the arms so I could maintain the blouse-iness of the top while closing the arm openings to a more comfortable level. I don’t always like exposing that much of my arms so I will probably wear a cardigan with this (perfect excuse to buy the Her Universe Tardis or Union Jack cardigans I have been lusting over). The skirt on this dress is MASSIVE. It has all these pleats in the front so it didn’t look as large until I laid it on the floor in the midst of sewing; it’s makes a half circle skirt…with pleats. The above photo shows the dress with a petticoat underneath; you can get a sense of how full the skirt is. Without the petticoat it’s still pretty impressive. Best part is the dress skirt has pockets strategically hidden by pleats. I love skirts and dresses (anything really) with pockets. Even if I don’t put anything in them, inevitably my hands will find my way into pockets. 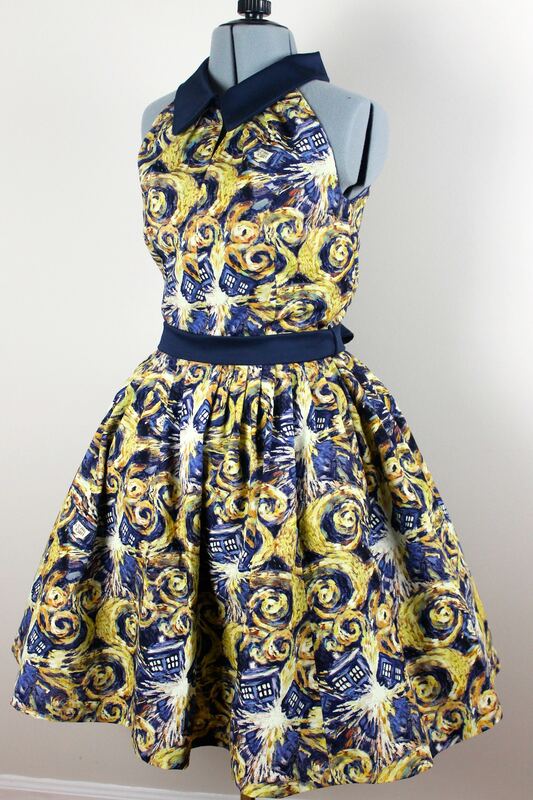 The print is attention grabbing and a different sort of boldness from the skirt. I think there might be certain days I could wear this to work, at least I’ll find a way. P.S. Notice how the photography of my skirt is different from my dress? I recently purchased some soft box lighting equipment off eBay for my photography lessons. I practiced with them for the first time to photograph the dress. What a difference controlled lighting can make! I am hoping to make it a habit to photograph new projects using the equipment. Hopefully soon I can get a set-up and backdrop so you guys don’t have to see the blah off-white paint of my walls.